As exotic as it may sound, growing up in Finnish Lapland meant that reindeer was always our number one meat to eat. During my years in Australia I've often been asked what is a common dish in my region in Finland, and I have always replied "reindeer". "YOU EAT RUDOLF?? ", has been the common response, and I suppose most people outside the Nordic countries would have the same reaction. There are always large herds of reindeer wandering around my hometown. Reindeer are a common sight, so it may seem strange that we are also so fond of their meat. Traditionally, all parts of the animal were used, and you can still buy products made out of reindeer skin, bones and antlers. Reindeer meat has a delicious clean game taste and it's low in fat. I am not a fan of beef or pork, and hardly ever eat any meat when back in Sydney, but reindeer meat is something I grew up eating, and I find it a whole lot tastier than any other meat. During our stay in Finland we've had reindeer meat in many different dishes including reindeer blood pancakes (my favourite), sautéed reindeer (which almost has a status of a national dish), reindeer and cheese soup, smoked reindeer on rye bread, dried reindeer heart and also reindeer and elk pies. There has certainly been no shortage of reindeer this Christmas! Reindeer blood (available from the freezers in all supermarkets) is mixed with water and rye flour and made into crisp, crepe like pancakes that are served with lingonberry. Top with lingonberries, roll up and enjoy! Mix the dry ingredients with the butter, add milk and mix to combine. 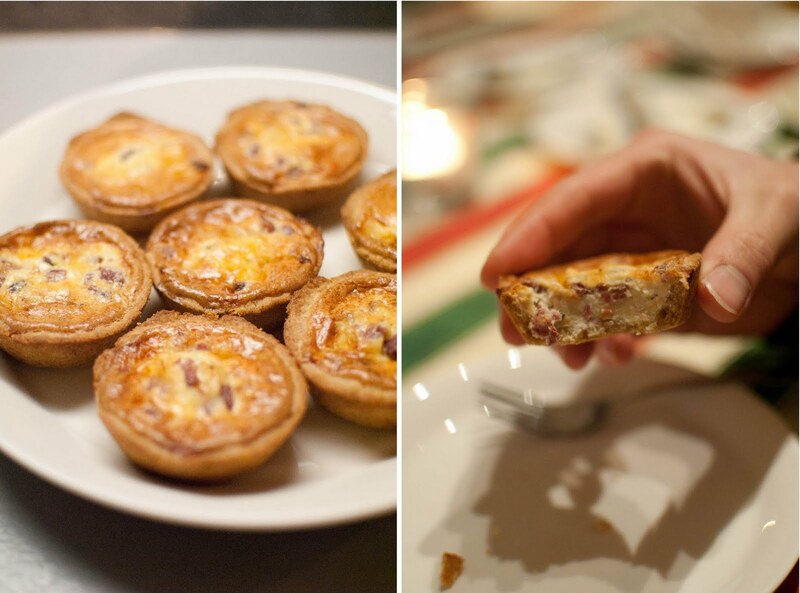 Divide the dough into two and form into bars. Cut each bar into 12 pieces and roll the pieces into balls. Press the pieces into a muffin tin to cup shapes. Stir together the ingredients for the filling and fill in the cups. Bake for about 15 minutes. Looks wonderful Maria. I'll have to get myself to Finland to try some reindeer! Strong cheese soup with reindeer sounds fabulous, along with some of the other dishes. Are the lingon berries made from Rudolfs nose?!? lol. Merry Christmas Maria. Is there some difference between reindeerblood and for example cows blood? 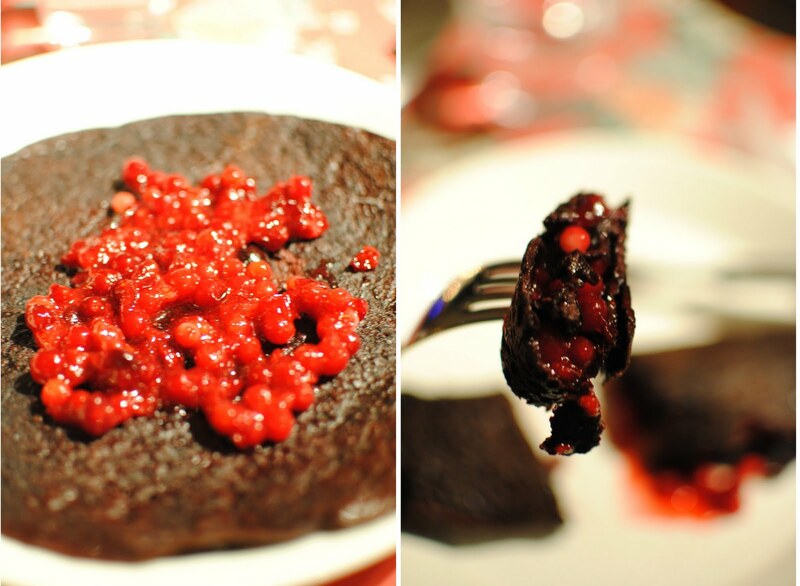 I´d love to try these "bloody pancakes ;)" with reindeer blood also. I have to say that in our market (in Nummela) there is only cows blood for sale. We love to put some applejam or apple-lingonperryjam to our bloodpancakes. And we always make those heart-shaped. i always make sure i eat some when i'm visiting sweden. we usually have reindeer or moose sauteed with mandelpotatis and lingon. but my favourite is the saami suovas. yum! that soup sounds brilliant. what cheese do you use? the blood pancakes sound intriguing. with lingon they'd be perfect. Wow! Reindeer is definitely a new ingredient to me. But this all sounds delicious. Anna: I used a Finnish 'laughing cow'- type cheese that's flavoured with smoked reindeer (yes, there's even cheese with reindeer available in here!) and a peppery cream cheese. 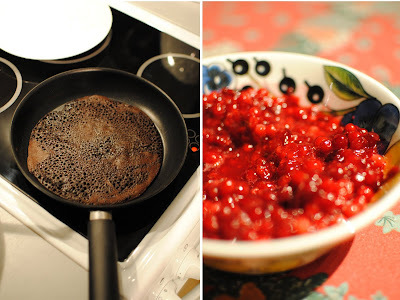 When I lived in Finland, no reindeer made the menu but school lunch included blood pancakes. Even the Finnish kids weren't all that happy about that. The favorite meal was fried fish (real fish of course, this was Finland after all) with mashed potatoes (real) and coleslaw (real). DELICIOUS! Alanna: I have to say that those pancakes that they serve in school here in Finland are from a different world than homemades. Schoolones are lacking that soft inside and crispy surface. For example. It's so funny that I never thought of reindeer as a food. They cannot be too different from the deer, elk and moose we eat in the United States. I am not too sure about the blood pancakes, but then I am not too fond of blood sausages or liver or anything that is too bloody. Thanks for a very informative post! Reindeer blood? I am intrigued! I've love to try all of these dishes one day. This is like people saying "You eat SKIPPY?" when they find out I eat kangaroo. I'd love to try reindeer someday! This is such an endearingly thoughtful and insightful write-up. I really do appreciate hearing (and eating, whenever I can) about the traditional cuisines of different cultures; it really illuminates so much about the people and their land. I've never had Finnish food (a very sad thought for me as someone who is forever on the move to indulge as many cuisines as possible) and I don't think, at least from my research, there exists any Finnish restaurants in Sydney. Or any other Scandinavian for that matter (IKEA doesn't count) - it's a real pity. I wonder if you may know of any that have slipped by my ears? Oh and I just read that you came from Lapland and so, I'd imagine, have come into contact with the Sami. I find them to be an endlessly fascinating group of people and wondered what's their traditional cuisine like? Just wanted to add that my memory is fleeting as I do recall I discovered a single Nordic restaurant here in Sydney: Gourmet Viking. I believe it's in Newtown - I'll be giving it a try soon! Not sure if you've been and whether you would recommend? i HAD to search for this post hahah. NICE! Reindeer blood pancakes! I guess cos I'm chinese and we get blood (congealed blood) I'm not really grossed out or anything, just curious. I'm going to find some venison blood for you! hehe. I went to Finland last year for my honeymoon and found Reindeer has a similar flavour to Kangaroo. Have you ever tried subsituting Reindeer for Kangaroo to make some homestyle recipes. You can also get Lingonberry jam at ikea.